Touchscreen additions aside, there isn’t a lot added to the Vita version of Epic Mickey 2: The Power Of Two, but at £11.99, it might be a good throwaway action adventure for some. Vita games have become really chameleonic in nature recently. For every Velocity Ultra there is a Call of Duty: Declassified and, currently, to every Hotline Miami there is Epic Mickey 2: The Power Of Two. For a game that came out last year on consoles to less than amazing reviews, it feels strange that SONY deem now is time for the splatter tastic (paint, not blood) game to grace its recently rejuvenated portable console thanks to the PS4 announcement and the recent large helping of indie games. 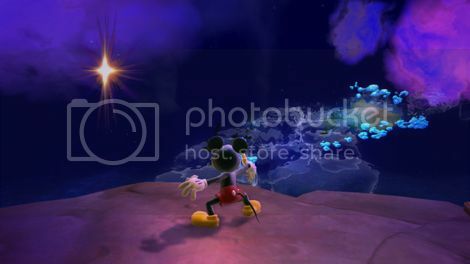 The premise of Epic Mickey 2 follows on from the original with everyone’s favourite mouse Mickey having the use of both a filler and a thinner brush to adjust the world around him. This time, we get the chance to play with Oswald the unlucky rabbit who manages to pull Mickey from his peaceful Steamboat world into a world full of enemies and some cracking narrative including the Mad Doctor, who insists that every narrative line needs to be spoken in song; a self deprecating move by Disney whose films seem to encourgae constant singing. At times the game is graphically stunning, especially the two dimensional level of the D.E.C., which is the same as the projector levels from the first game. Used mainly to get between destinations, the DEC provides platform purists with some love as it’s a multilevel path that involves intricate jumping and ball pushing. 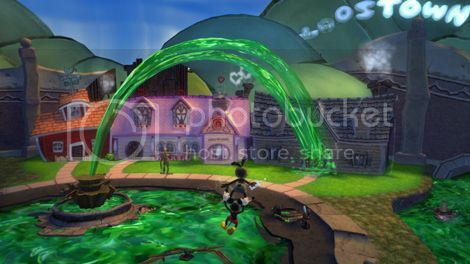 Sadly for Epic Mickey, its control scheme is not that tight when it comes to jumping. Numerous times whilst playing, the ability to jump precisely was ruined by the game responding slowly to the button press and sometimes ignoring it completely. For a platformer, this is sacrilege and is enough to condemn a game to the bottom of the bargain bin. In the days of Spyro the Dragon and Croc, this could be forgiven, but in today’s post Super Mario Galaxy era, poor control schemes can not be forgiven. 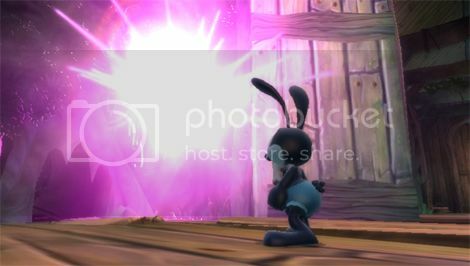 Power Of Two is built around the premise that two players can link up and play; one as Mickey, the other as Oswald. This idea probably works (I never got a chance to try it on the Vita as no one was around to link up) however, the abysmal AI of Oswald if playing alone is hard to get past, even in the early stages. You can end up waiting for a while for the AI character to appear to help use his electric jiggery skills. It is both frustrating and unsatisfying at the same time. Touchscreen additions aside, there isn’t a lot added to the Vita version of the game, but at a retail price of £11.99, it might be a good throwaway action adventure to add to your collection.